Walter Axe was born in East Chinnock in 1887, the son of farm labourer Stephen Axe and Sarah Ann née Foot. Walter was a mason's labourer and spent most of his life in East Chinnock although he moved to Yeovil after he got married and he and his wife, Nellie Elizabeth, lived at 4 Stars Lane. It is not known when Walter enlisted although it is known that he enlisted at Yeovil and most likely in 1914 because of his Service Number 3/7451. He joined the 1st Battalion of the Somerset Light Infantry. Walter Axe saw four years of almost continual fighting as he most likely took part in all the following battles with the 1st Battalion of the Somersets. By 1918 Walter had been promoted to Corporal. Walter Axe was not killed in any specific battle but fell during day-to-day fighting in the front line on 22 April 1918. He was aged 31. 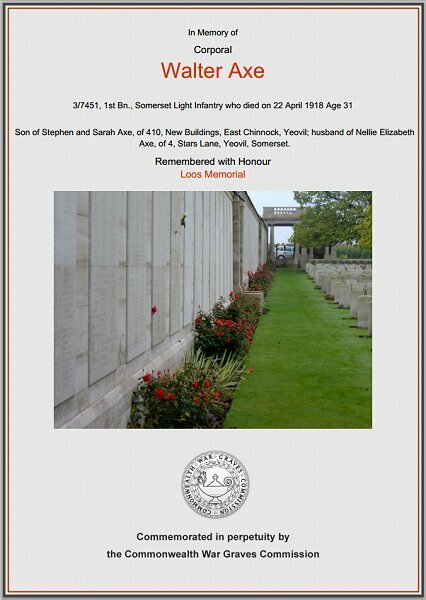 He is commemorated on the Loos Memorial, Pas de Calais, France but his name is not recorded on the War Memorial in the Borough. The Commonwealth War Graves Commission certificate in memory of Walter Axe.